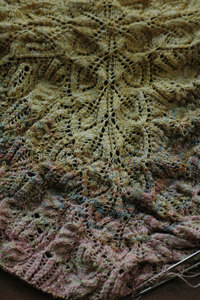 Bel's shawl is off the needles and to me it looks like a butterfly. Of course it will straighten out after blocking, but I'm tempted to let the edges with whatever fringe I choose ripple - it seems to want to do that anyway. The colours look fabulous. This picture was taken with my new camera in very low light, but I just had to try it. These 2 images are to show the progress in my Frost Flowers and Leaves Shawl, which of course has been put aside to work on the Bellflower shawl. I think that the transitions here work from colour to colour.... and there is one more colour to add - more of a solid soft pink. contents © Esther Budd, 2007. All rights reserved.